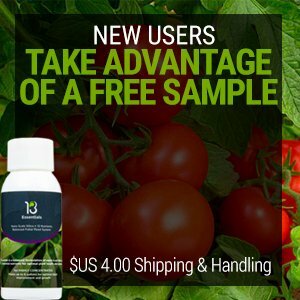 13Essentials- Using nano-scale technology to send teeny-tiny micronutrient particles as small as 1 nanometer into the leaf of the stomata, where they are needed most, 13Essentials foliar cannabis fertilizer ensures that your plants are getting the nutrients they need to grow and thrive like never before! These nutrients and micronutrients are a vital part of an efficient photosynthesis, which increases the health of your plants and lowers the possibility of disease. 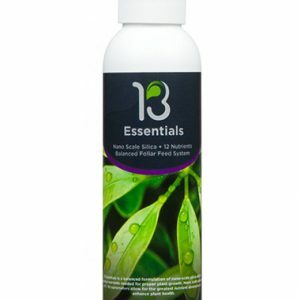 Specifically designed to safely improve the overall health and size of your plants, 13Essentials is as easy to use as it is effective. Try it for yourself and see the difference in the quality, size and density of the next crop you harvest. Not certain how much 13Essentials foliar cannabis fertilizer you need to get started? Below is a list of the breakdown of which bottles you need. When you use 13 Essentials, you’ll see the results right away. Yield larger, more bountiful crops than ever before, all with using less product than you have ever needed to use before. You’ve got to see the benefits of 13 Essentials on your plants to believe it! ARE YOUR BUDS STRUGGLING? Still on the fence? Feel free to see for yourself how 13 Essentials has helped growers all over the country increase both the overall health and yield of their crops. We know as growers there are problems that every grower can face during the cycle, and we understand how difficult those obstacles are to overcome. If you’re looking for a bit of literature to help you get the biggest, best plants possible, consider our guide to the top issues growers face!